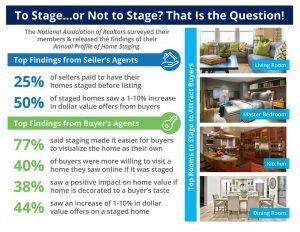 Are you about to put your home on the market, but aren’t sure if you should stage it for sale? The National Association of Realtors just released a report that states “50% of sellers saw a 1-10% increase in dollar value offers from buyers” and “77% of buyer’s agents said staging made it easier for buyers to visualize the home as their own.” Furthermore, the top rooms to stage to attract more buyers are the living room, kitchen, dining room and master bedroom. Click here for more reasons you may want to consider staging and give me a call if you would like to chat more about listing your home!